All movies and animations exploit imperfections of human eyes. In our real world things move continuously, but in a movie (and in an animation) is the feeling of movement created with a lot of pictures going one behind another and on every next picture is the moving object (for example a ball) a little bit shifted. Human eye can see not a lot of pictures with different position of the object (the ball), but one scene with moving object (the ball). When we want to create an animation, for example a ball flying over a playground, we need a background picture (the playground) and the picture of the ball. From these component we can create a few different pictures - on every picture there will be the ball shifted a little bit more (to the left, for example) than on the previous picture. If we want to create a 3D animation then all the pictures mentioned above have to be anaglyphs. For every picture we need the left picture (the scene as it can be viewed by the left eye) and the right picture - and then we create a 3D picture from them. From a few 3D pictures going one behind another we can create a 3D anaglyph animation. There is a lot of ways how to create all the 3D anaglyph pictures. They can be rendered in a 3D software, made as collages or computed in a specialized software for anaglyph animations. We have decided to use the first method mentioned above for our example. 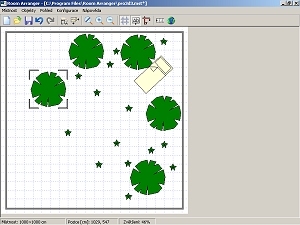 We've used the Room Arranger software - you could read about it in one of our previous articles (if you've forgot how to use it then you can read it here ). We created a scene with trees and moving bed (like in one Fantomas movie). The scene size is 1000 x 1000 centimeter, all the objects are in it's right upper corner and the camera is directed in the angle 45 grades (to the right upper corner) on the position 50, 950 for the left picture and 60, 960 for the right one (talking about camera we mean a point of the observer - you can set it with the button Explore in 3D). On the first scene is the bed in left upper corner. We've created the left image and the right image and created first anaglyph image. Then we shifted the bed a little bit to the front (to the left down) and did the same once again. This way we've created 6 anaglyphs - on every newer anaglyph is the bed shifted a little bit nearer to the observer. When you create anaglyph you should use the same shift of the left/right picture in 3DJournal software (we recommend to test it on the first picture and the use the same for all the other pictures). Vertical shift isn't necessary (and recommended). If you need to crop only a part of your picture then its necessary to crop all the pictures in the same way (you should start cropping in the same point and all the pictures should be of the same size). 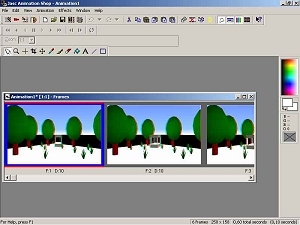 For creating the animation we recommend the PaintShop software (we've mentioned it in the article about collages ). Open all the images and then place them to different layers. How to do it? Take the first picture, choose (in menu) Layers/New Raster Layer/OK and paste the second image. Choose Layers/New Raster Layer/OK again and paste the third picture. And again, again, again... Then save the picture as PSP image and run Animation Shop (File/Jasc Software Products/Launch Animation Shop). In the Animation Shop set File/Preferences/General Program Preferences - Layered Files - Keep Layers as Separate Frames. Open the saved PSP image. You should see all (or a few of) the images one behind another like on a film. Now you can press the button with film image in the right upper corner of Animation Shop - and you should see your animation. You can set the duration of every image of the animation (use right mouse button on the picture and choose Frame Properties/Display Time). The finished animation can be saved to a GIF file (we recommend to use 255 colors). If you have problems with colors in your animation, you can try to decrease color depth of your first image in PaintShop to 256 colors (Colors/Decrease Color Depth/256 Colors) and save it's palette (Colors/Save Palette). This palette you can use in the Animation Shop later when creating the GIF file (press the button Customize/Custom Palette + Error Diffusion). The finished animation can be saved to other formats as well - without the problems with colors. But there could be a problem to show the animation on the Web.